Collins Booksellers - Moral Development by William Kay, 9781351754675. Buy this book online. Although the work of Piaget dealt with the intellectual development of children, and that of Goldman with a child’s religious thought, there had hitherto been no comparable book on child morality to complete the developmental picture of the time. 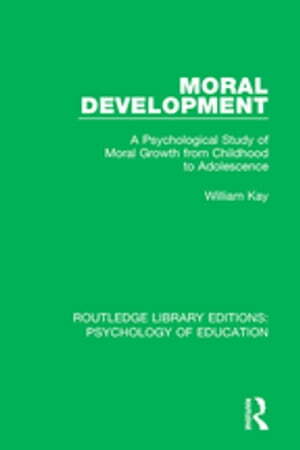 Originally published in 1968 William Kay’s book was designed to fill this gap, for he offers a complete description of the moral growth of children from infancy to adolescence. Dr Kay was writing specifically for students and practising teachers and carefully avoids specialist jargon where ordinary terms suffice. He concludes that the findings of research into attitude formation and change could provide teachers with those techniques to help their pupils become morally mature members of society. His book contains a valuable analysis of the development of ideas concerning moral growth, and is a bold contribution to the problems of moral education.